Overall, my research interests focus on interactions between two of the most important groups of organisms on the planet: plants and insects. Together, these two groups make up a substantial amount of terrestrial diversity, and are often ecologically and evolutionarily linked to create the defining characteristics of a particular habitat or ecosystem. Broadly, my research on these interactions spans three main topics. 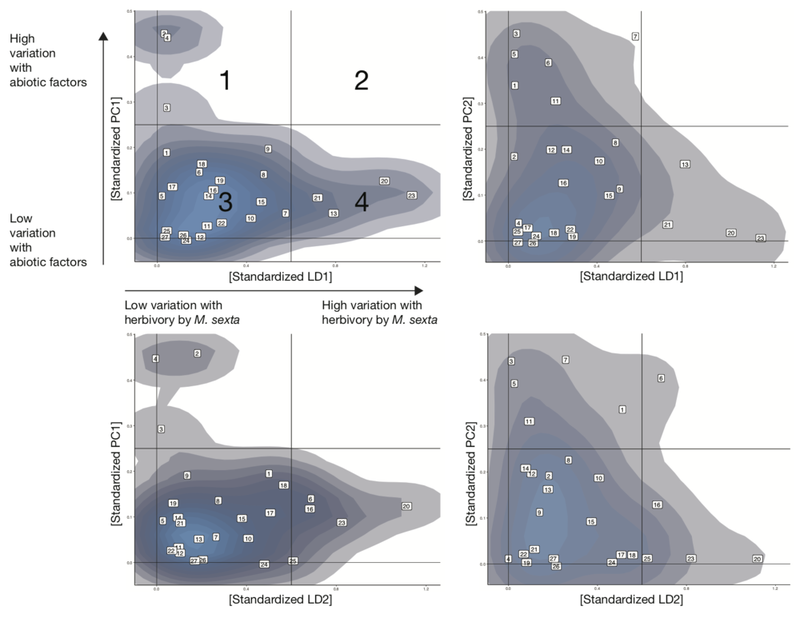 Insect herbivores face multiple levels of variation in plant quality. Many herbivores are generalists, and can survive on a number of plant taxa, while others are specialists, and contend with variation among individuals of single (or closely related) species. This variation in plant quality (either through nutritional differences or because of defensive phytochemistry) can have strong direct impacts on the performance and fitness of insect herbivores. 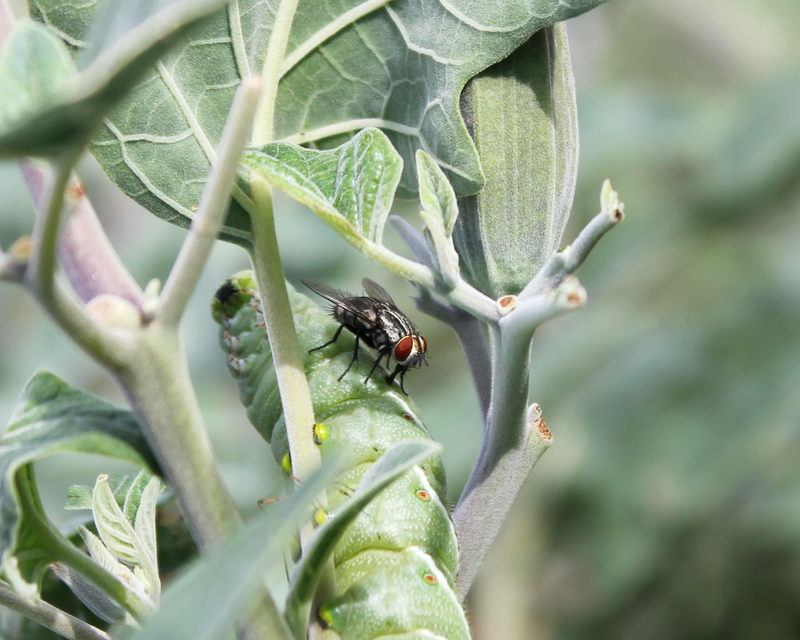 Cataloging these major effects has been a large focus of the nutritional ecology of herbivore-plant interactions over the last four decades, but we know far less about more subtle effects that variation in plant quality can have on insect physiology. Moreover, even less is known about how these subtle effects play out over ecological and evolutionary time when insect herbivores contend with predators and parasitoids. The immune system is a particularly important tool for insects defending themselves against parasitoids - any reduction in immune function due to sub-standard nutrition could have drastic consequences for fitness for herbivores in the field, even though major effects on performance or fecundity are absent. The discovery of ‘talking trees’ in 1983 catalyzed research on the airborne chemical language of plants (Baldwin and Schultz 1983). We now know that these chemicals, termed herbivory-induced plant volatiles (HIPVs) are produced in most plant species and serve an array of communication functions. As the list of examples of HIPV production and reception by other organisms has grown, biologists have called into question the evolutionary dynamics at work. Though it is clear that plants actively synthesize and emit HIPVs, we don’t yet know what the fitness benefits are to plants and whether selection acts on plant volatile emission. Furthermore, though there are superb examples of insect carnivores using HIPVs as host-finding cues, this work is often examined in laboratory and/or agricultural settings. Crucial information is missing about the behavior, natural history, and ecological dynamics of important taxa such as egg parasitoids and tachinid flies that play large roles in structuring natural communities and ecosystems. My research has focused on examining some of these under-studied groups in natural settings, with focus on the behavior, the effects on herbivore performance, and the modeling of effects on plants. Environmental variation is a major mechanism that drives ecological patterns. These patterns are often the result of direct effects; organisms experience variation in ecological parameters (e.g. temperature, humidity, pH) through a physiological buffer, and through changes in performance, either do well in a particular set of conditions, or do not. We know less about how the environment affects the performance of communication systems (and olfactory communication systems in particular), and to what degree this shapes the distribution and abundance of organisms on a landscape. My work has focused on how environmental variation is filtered through the lens of organismal physiology to determine novel ecological scenarios: the production of HIPVs by a desert perennial attacked by an herbivore, and how microclimates produced by plant leaves benefit developing insects. This basic understanding of how environmental variation affects important communication systems is a crucial piece in unraveling the full effects of climate change on ecosystems. A female Drino rhoeo parasitoid assessing a Manduca sexta caterpillar host. Two intersecting streams of airborne VOC information.